Last night I cooked. Yes, that’s right, I cooked. I can hear the shocked gasps as my two sisters read this because unlike most of my readers they know that I don’t normally cook. I can reheat, I can throw a sandwich together and a salad or pour a mean bowl of cereal but I don’t often cook. Hell I had to create a whole new cooking category for this post. Mostly it’s because I’m way too tired when I get home from work to bother doing anything other than the above and really it makes for a pretty unhealthy lifestyle most of the time. So Gary and I have decided that we are going to branch out. We are going to try new recipes and eat healthier because as much as I love my bowl of fruit loops, I don’t think it was meant to be dinner two nights of the week for a 32 year old woman. So this weekend I started searching some of the cooking sites and came across this lovely recipe for Greek Spiced Baked Shrimp. Gary and I are both big fans of shrimp and feta so I thought why not, I’ll give it a shot. I was a bit wary of the spices but it got some great reviews so it sealed the deal for us. Last night I came home tired but determined to try this recipe. I fiddled, I measured, I chopped, I pinched and dashed, hell I even sautéd and damn it I was pretty damn proud of myself because I was “cooking”. I felt like a grown up and a healthy grown up at that. I also quickly realized that our kitchen is really disorganized and not really set up for the whole cooking scene but that’s another post for later. I must say while cooking the sauce the spices smelled absolutely heavenly together. Once the shrimp was in and the dish was topped with feta, I threw it into the oven. We weren’t sure how the dish would turn out so we made some penne pasta to go with it. I would skip the pasta next time and just serve the dish with some fresh crusty bread (we used buns because the store was out of fresh loaves) and a nice green side salad. I would also try making it next time with low fat feta to try and make it even healthier. So go ahead, if you’re feeling adventurous give this recipe a try. Hopefully you won’t be disappointed. Gary and both agreed that this was the best shrimp dish we’ve ever eaten. 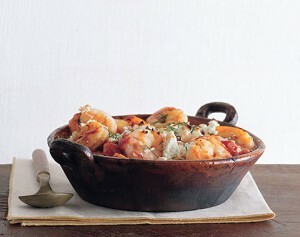 These saucy shrimp spiked with cinnamon, allspice, and feta quickly disappeared in our test kitchen. Have plenty of bread on hand for sopping up the juices. Cook onion and garlic in oil with 1/4 teaspoon salt in a 4-quart heavy saucepan over medium heat until softened, about 5 minutes. Stir in spices and cook, stirring, 30 seconds. Add chopped tomatoes with juice and sugar and simmer, uncovered, stirring occasionally, until slightly thickened, about 20 minutes. Remove from heat. Season shrimp with 1/8 teaspoon salt, then stir into tomato sauce. Transfer to a 2-quart shallow baking dish and top with feta. Bake until just cooked through, 18 to 20 minutes. Serve sprinkled with dill. Thanks Shannon! If you want to email me a couple of your favourite recipes that would be great 🙂 I also don’t like precooking on Sunday’s because I would much prefer to watch movies curled up on the couch. Cool! Sounds yummy. I’ve been cooking a lot lately. It helps to have someone to cook for. I love all the smells that come out of the apartment when I’m cooking. I even made a jambalaya this week! !